This action provides an interface to the VB6 compiler. 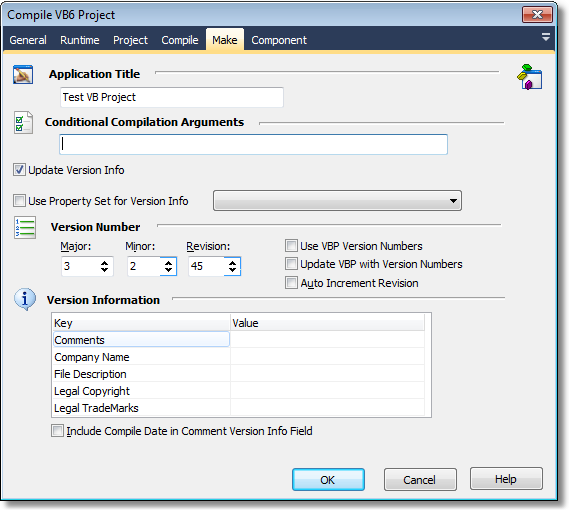 This action maintains the Version info and some other settings separate from the visual basic project file (.vbp). Before running the VB compiler, FinalBuilder creates a temporary .vbp file using the settings from the FinalBuilder action and from the actual project.vbp file. 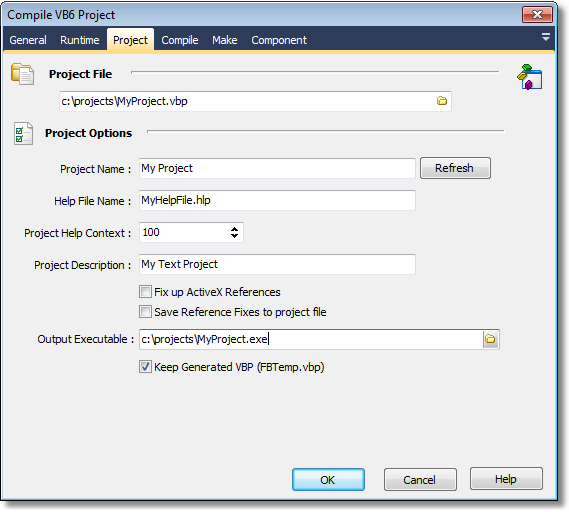 Project File : Specifies the path and file name of the Visual Basic project file that you wish to compile. Refresh Button : Refreshes the settings from the project.vbp file. This will overwrite the changes that you made in FinalBuilder. Project Name : Identifies the project in code. It can't contain periods (. ), spaces, or start with a non-alphabetic character. For a public class name, the project name and class name cannot exceed a total of 37 characters. Help File Name : The name of the Help file associated with the project. Help Context ID : The context ID for the specific Help topic to be called when the user selects the "?" button while the application's object library is selected in the Object Browser. Project Description : A user-friendly name for the project. Displayed in the References and Object Browser dialog boxes. Output Executable : The full path and file name that the project will be compiled to. Note that if you use the AutoInc Version Number, you need to save the FinalBuilder project after building for this to be saved. Alternatively, use a FinalBuilder Project variable and read the value from an ini file before compiling and then write the variable back out to the ini file after compiling. When using Project or No Compatibility with ActiveX DLL projects, the CLSID's for those projects change with each compile or interface change (depending on the compatibility setting). This will invalidate references to those dll's in other projects. When the Fix up ActiveX References option is checked, FinalBuilder will check that the references are correct, and if not correct them. It does this by locating the type library and extracting the CLSID and comparing it to the reference entry, if they are not the same then the reference entry is corrected. This will enable FinalBuilder to compile the projects correctly, and also help you avoid the dreaded 429 Ole Automation error.